Jurgen Klopp was left delighted after his Liverpool side sealed a vital 2-0 victory over Chelsea on Sunday, restoring their place at the top of the Premier League. The Reds arguably rode their luck in the first half, but turned on the style soon after the break at Anfield, with Sadio Mane opening the scoring with a far-post header. Significantly more impressive, however, was Mohamed Salah‘s strike to double the lead, arrowing a phenomenal effort from outside the box into the top corner, far beyond a sprawling Kepa Arrizabalaga. With Man City winning at Crystal Palace earlier in the day, a win was essential for Liverpool. And having seen his side move back to the top, Klopp emphasised its significance in his post-match press conference. “Apart from the 10 minutes when Chelsea changed system and had their chances, when Ally saved our life, we controlled and dominated the game for 80 minutes, which is probably the best you can say about a game against Chelsea,” he said. “But in these 10 minutes, if they were 10 minutes, they could have changed the game completely—[hitting the] post and two saves from Ally. “That was a bit dangerous, of course, but then we controlled the game again. 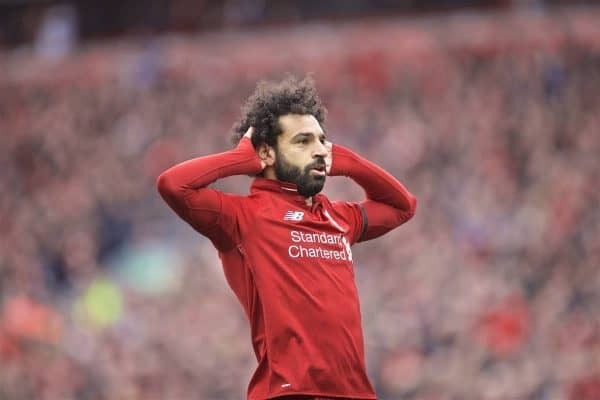 Salah’s goal was sensational, and will be considered among the candidates for Goal of the Season, and the manager reflected on his perfect view from the touchline. “It blew me away. I was really happy. I saw it really well; maybe I saw it first the ball would go in,” he said. “It was a really, really outstanding finish. And I don’t want to minimise that but I loved the first goal exactly the same. “It immediately reminded me of the 4-3 against Borussia Dortmund, only Hendo instead of Milly and Sadio instead of Dejan, but a similar situation with this wonderful cross in that area and really good team play. This is a big boost given Henderson’s upturn in form, and he may start again as Liverpool head on the road in the Champions League, to play Porto on Wednesday night.